The ship, KLOS C, is being escorted to the Israeli port of Eilat, and is expected to arrive on Saturday. The Israelis have said that their preliminary inspection of the ship has turned out that it was transporting dozens of M-302 rockets, which have a range of 150km to 200km (93-124 miles). 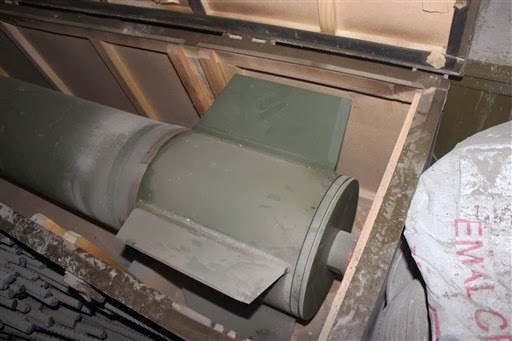 The Israelis say that they have followed the weapons shipment for several months as they were flown from Damascus to Tehran and then taken to a port in Bandar Abbas for shipment to Sudan, and from there to Gaza. Meanwhile, the Sudanese foreign ministry today denied any knowledge that the ship heading to Port Sudan had contained weapons. Why do you need a bag with "Made in Iran" on it to prove that the ship was coming from Iran? Maritime movement monitoring agencies do record the places ships visit and the dates. It would have been odd for a ship that had spent sometime at Bandar Abbas recently not to have an Iranian cargo on board, don't you agree? So the question is not related to sacks of cement. But was there any weapons on board? If there were those weapons, they could have only been loaded onto the ship either at Bandar Abbas or Umm Qasr, the Iraqi port the ship visited before sailing to Sudan (again the public records of the ship's movement show all port visits). If there were weapons, highly unlikely that the Iraqis loaded them. How can it be proven that the weapon wasn't loaded at the iraqi port as it is common knowledge that iraq suffers from insecure border. And one important fact that cannot be overlooked is the coincidence between this incident and AIPAC conference. As Zarif said it is a failed lie. one- the terrorist attack in Bulgaria !. When this sad incident took place a certain Nation was quick to point its finger to the Hezbollah and Iran.Iran denied this and offered logical arguments to absolve her self from blame-No western European or Western intelligence source has came forward to endorse the false claim heaped on IRAN. Some western media houses had predicted that Assad would use gas on his citizens.So when the episode unfolded it was easy to point at the Syrian leader ,Iran offered logical explanations to refute this LIE.Joined by Russia truth won the day and the BOD was forced to reluctantly call off a dangerous killing mission! !.Some months after this incident it has been proven beyond doubt that IT IS THE Rats who stage managed this .since then ,the silence from the West on that issue is deafening!!.. for these reasons and more , the world has viewed the IRANIAN Nation as one that always stands on the side of truth !. in addition to timing revelation. 302 mm is made by china turkey or Thailand http://en.wikipedia.org/wiki/List_of_rocket_artillery . Why would take it from arms deprived Syria and transport it to Iran then to other places. Iran could have sent the 333mm that manufactures save the transportation and manufacturing cost. one may argue deniability due to manufacturing origin! They send money and acknowledged, procurement may be(Gaza can by anything with money) transport not likely right in the middle of negotiation. However, Iran also sent money $220 million Aid to Pakistan when flooding disaster happened two years ago. The illegal shipment of weapons shows the true face of Iran! Iranians are embarrassing themselves by constantly lying.reminds me of Baghdad Bob when Saddam fell. Why do Iranians think the world is stupid?